China Mary was a common nickname sometimes given to women who emigrated from China to North America in the late-nineteenth and early- twentieth centuries, but China Mary of Sitka was anything but ordinary. 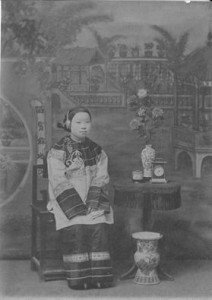 She was just fifteen years old in 1895 when she became the first female of Chinese descent to live in Sitka. During the nearly 63 years she lived in Southeast Alaska, she operated laundries, restaurants, a mink ranch, and a fox farm. She served as a midwife and worked at the federal prison. She was even the first female troll fishing boat operator in Sitka! Click here for a closure look.